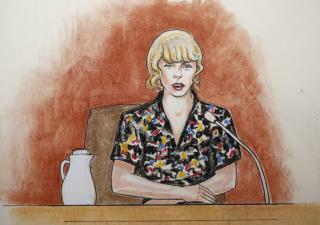 (Newser) – Taylor Swift's former bodyguard testified Friday that he saw a DJ reach under her skirt a moment before a photographer snapped their picture during a meet-and-greet where the singer says the radio host groped her, the AP reports. Security guard Greg Dent, who no longer works for Swift, said he was standing a few steps away but didn't intervene because he generally took his cues from the pop star, and she gave him no signals during the 2013 pre-concert encounter at a Denver arena. Seated at her legal team's table in a federal courtroom, Swift chuckled when Dent testified that, after the photo was taken, he suspected that KYGO-FM host David Mueller would be at the bar of the arena—and another guard found him there. I bet she charges $5 for head. If I was a woman & a guy grabbed me, I would slap him & cause a scene. Betchya ' he wouldn't try it again. Tailor should be sued for pretending to be a musician.